A final report of the Rise Up project is due out in the next few weeks – we will attempt to post here!. BUT IN THE MEANTIME, thanks to the advocacy aspect of the work a new SSASGD group is starting up in Cardinia Shire through Youth Services. Be Ur Self is a new social group for young people 14-21 who are questioning or identify as gay, lesbian, bisexual, transgender or intersex (GLBTI). Be Ur Self meets weekly and participates in a variety of fun activities, all activities have been selected by the group members themselves. Great initiative to see arising from ENUFF! The lack of safe spaces, and the targeted attacks and violence experienced by SSASGDY was one of the big issues identified by the community, that led to shut-down/and risk behaviour. This outcome is a welcome initiative! 2013-2014 Training: We are starting up our new TO ‘training’ calendar. Commencing at the end of this year running through until next year. For many reasons, we have chosen a new approach. We are offering a year long TO mentor in action – program. This program will offer opportunities to learn from a range of different facilitators who will run workshops focused not just on techniques, but on praxis, particularly how praxis relates to certain issues (Gender, Conflict, Anti-racism and more). In the space between workshops, we will host informal reflective groups to talk about how we are navigating the application of what we are learning. These groups will either be face to face or via skype. One of our first facilitators will be S.Leigh Thompson from the Forum Project NY. S.Leigh will be running a 101 anti-oppressive praxis / TO workshop followed by a workshop on gender: beyond binaries. Future guest facilitators will be coming out from Brazil, Israel, Colombia, and South East Asia. The co-mentoring project hopes that by running workshops and meeting it will give people an opportunity to talk through techniques, the challenges of theory and practice. Our aim is to move beyond TO as a tool kit, to deeply reflect on different ways, and their meanings to engage with the work, that needs to be pulled a part and critiqued and examined in the context of the politics of creative industries and what Augusto Boal called a rehearsal for life/for a revolution. We are hoping to offer a space to think about facilitating the work, motivations – locations etc, an to explore what brings us to an anti-oppressive practice, howwe navigate our desire for change in the face of a increasing Neo-liberal value system. If you want more info, or to stay in the loop re this training – send us an email. Snuff Puppets in Thailand. We made it happen! 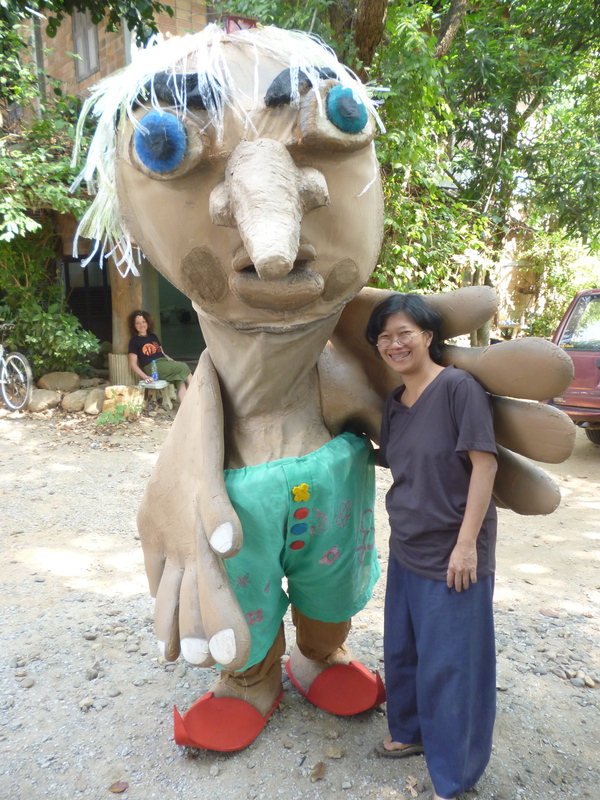 TWT invited local Thai artists and activists to a ten-day workshop with guest facilitators from the SNUFF PUPPETS. The workshop was held in Chiang Mai, Thailand and has been the culmination of determined submission writing for close on 18 months. The project involved nine days of hands on puppet building around the theme of the impacts of globalization. It culminated in two experimental showings of the puppets, in a public space: at the 3 Kings, and a public park in the south-west of the old city. Since then, the puppets have been put to use in a surprise interruption in a local village. There are also plans a foot to use the puppets to mount a play focused on talking about deforestation, tourism, globalization, and of course how all of that ties in to ‘trafficking’. Third Way Theatre sends a big thanks to the following artists: Chompunuchh Supa (Rajabat University – Dramatic Arts), Jutmamat (Rajabat University – Dramatic Arts), Jiratchaya Pripwai (Visual Artist), Wichan Tala (CM Green City), Sutarath Sinnong (Home Made Puppet Company), Preeyakanol Noykorn (Sharing Dream and Mind), Omphan Lutgenhorst (Empty Space and Puppets without Borders), Jae Sirikarn Bunjongtad (Makhampom Chiang), Bank (Sustainable City) Myriam Bourez (ACTORS, France, and TWT), AND an especially big thanks too: Sasiton Kamrit (Gabfai Ctp). Amerin Plengursme (GABFAI), Meeber Lacsoeh, Wandering Moon for the space and of course, not to be forgotten: all those who dropped in and picked up a paint brush, glue gun, or just get us going with their enthusiasm. And finally big thanks to Snuff Puppets who agreed to come out and host this PD opportunity. Adrian Jackson in Australia – November workshop and public lecture dates. Just a reminder that it isn’t long now before Adrian Jackson (from Cardboard Citizens) arrives to Australia for a series of Lectures and workshops in Melbourne, Brisbane, and Sydney. Melbourne 19th Nov. Xris Reardon of TWT and Adrian Jackson are facilitating a workshop on Australian Identity in a Globalised world: Focusing on Image Theatre techniques. This workshop will take place at the Multicultural Hub in the city. There will be an opportunity for those who participate in the workshop, to show back the images we created at a gathering organized by Occasions (co-ordinator by Jamie Oliver from VCA center for Cultural Partnerships). The “showing back” will provide an opportunity to further the conversation of Australian Identity/ies. At this event, Adrian Jackson will also talk about his theatre practice and company. Sydney: 21st Public Lecture, 7pm. Loreto Kirribilli. Sydney 23-24th Two day workshop for Educators. Educators interested in TO and it’s application in a high school drama class. Hosted by TWT, Borderlands, OASES, and Loreto Normanhurst. For those interested in attending any of the above lectures or workshops – contact thirdwaytheatre@gmail.com or 9017 0118. Welcome to third way theatre’s new website. We hope this new website will support us to keep you updated about workshops, activities etc, as (drum roll) we have a blog! So check the site out, and remember it is still a work in progress! Comments are welcome!